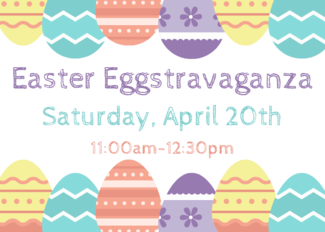 Our annual Easter Eggstravaganza is on the horizon and we need an army of volunteers to make it a great event for families in our community! Before the event, we will need help setting up. During the event, we will need help being the hands and feet of Jesus to our guests by greeting and running the special "Rise Up with Jesus" activities. After the event, we will need help with tear down and clean up, so we will be ready for our 4 Easter services. I’ll bring Olivia with me. Lead guests in a fun hands-on activity to share the message that "Jesus is Alive"
Could Cal and Linn do one together? Help lead guests in a fun hands-on activity to share the message that "Jesus is Alive"